Capt. MD Herring was one of the pioneer citizens of Waco and a leading lawyer there for many years. 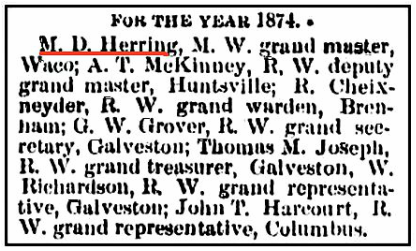 Captain Herring was born in Holmes county Mississippi in 1828 and died in Waco in 1897 His wife was Miss Alice Douglas. Captain Marcus D Herring was born October 11 1828 and educated in Mississippi and Louisiana. Before he was 20 years of age he was licensed to practise law In Texas. He resided in Austin from 1853 to 1856 when he removed to Waco where he practised very successfully his profession. During the last three years and nine months of the civil war he served in the confederate army. Capt Herring was a royal arch mason and belonged to the IOOF being the founder of the widows and orphans home of that society. The Herring family moved to Carrollton, MS in 1836. Marcus D. Herring attended Judson Institute in Carroll County and the Centenary College at Jackson where he read law under the guidance of the college president, Judge David A. Shaddock. He practiced law at Shreveport, LA, before removing to Texas in 1850. While passing through Shelby County, he was injured when his horse stumbled. Herring remained at Shelbyville to recuperate and to practice law. In 1853 he moved to Austin, where he served as clerk of the State Legislature for a year, then removed to Waco and opened a law office. During the Civil War he served in one of the first volunteer companies raised in Texas to aid the Confederate cause. At the close of the war he returned to Waco and resumed his practice in partnership with James Anderson and later Richard Coke. The firm of Coke, Herring and Anderson became Herring, Anderson and Kelley, then Herring and Kelley. On Oct. 7, 1856, Herring married Alice Gray Douglas of Waco; they had 4 children. 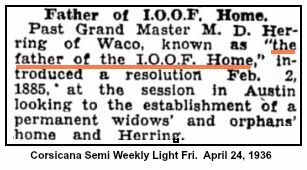 He was a charter member of the first lodge of the Independent Order of the Odd Fellows organized at Waco and was elected Grand Master in 1874. He was also a member of the Sovereign Lodge for 10 years and was largely responsible for the founding of the I.O.O.F. home for orphans and widows of the fraternity at Corsicana. Photo of children from home for orphans. 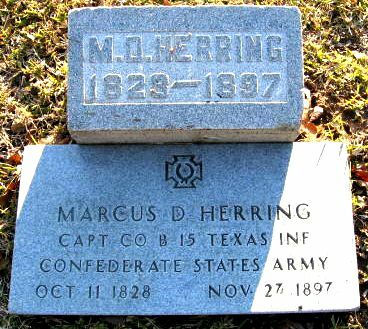 Marcus Herring died on November 27, 1897. At his funeral, the double file line of Odd Fellows and Masons marching past his grave took two hours to make one pass. It was said to have stretched 1.5 mile long.